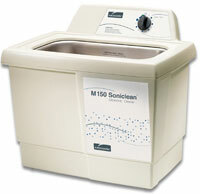 Midmark Soniclean Ultrasonic Cleaners are some of the quietest in the healthcare industry. No one will argue that ultrasonic cleaning is the fastest, most consistent and safest method of cleaning instruments and components. But because ultrasonic cleaners emit a high pitched sound, no one ever accused them of being quiet…until now. 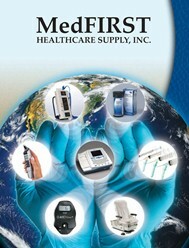 The Midmark Soniclean uses a high frequency transducer that allows the unit to perform quietly. Tiny cavitation bubbles are produced with the higher frequency, allowing the bubbles to penetrate smaller crevices. This results in a powerfully quiet ultrasonic cleaner. The Midmark Soniclean is extremely easy to operate - simply load your instruments and set the timer. You'll be impressed with how effectively the Soniclean handles your instrument cleaning needs. Other ultrasonic cleaners use a standard slim wafer transducer, limiting the maximum sound pressure that can be generated to 2-3 watts per square inch. The Soniclean utilizes an industrial-type ultrasonic stack transducer, resulting in a cleaner that is capable of reaching 12-15 watts per square inch. This superior acoustic pressure generated by the stack transducer, coupled with the Soniclean's Overlapping Wave Frequency (OWF) technology, produces powerful cavitation. More power in the tank translates to cleaning your instruments more efficiently. Every office has different ultrasonic cleaning needs, depending on the number of patients and the types of procedures being performed. That's why Midmark provides you with three size options that can be placed on the countertop or even recessed. 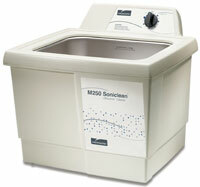 An independent national laboratory ranked the Soniclean “the quietest ultrasonic cleaner” among all units tested. In addition, it was the only unit ranked “excellent” for noise comfort. That’s important for your staff and patients. Use on laminate, stainless steel or stone surfaces. Allow 2.5" (6.4 cm) on sides and rear and 12" (30.5 cm) above, to allow space to fill the tank.